Spacious Condo ~ Steps from the Emerald Gulf ~ In the Heart of Seacrest Beach!! At The Charlotte, location and luxury greet you with a sun kissed “Welcome Home”. 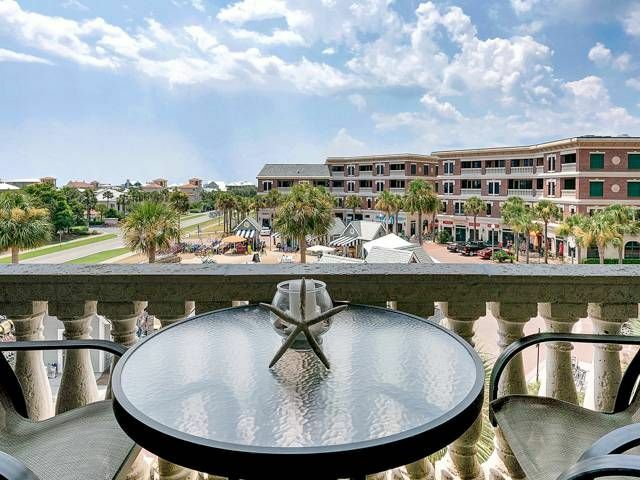 This third top floor unit located in the heart of the Village of South Walton in ever-popular Seacrest Beach is nestled next door to Rosemary Beach and a short walk to Alys Beach. Upon arrival you simply park and walk or bike ride to wherever your vacation invites you. The beautiful “Coastal Themed Retreat” unit is sophisticatedly decorated by a local designer perfect for a romantic getaway or a family vacation. This three bedroom unit offers you comfort with a master suite featuring a king bed, reading area, and private access onto the patio. Guest room two has a king bed and reading corner. The third guest room is a full over full bunkroom. The two guest rooms share a spacious full bath. Each bedroom has a wall mounted flat screen TV. The living area is comfortably arranged with a sectional sofa to keep family together. A 55” wall mounted Smart TV with cable also allows you if desired to access your Netflix/Hulu accounts. The dining table seats six with an additional four seats at the counter. The fully stocked kitchen offers all the amenities of home. New stainless steel appliances and quartz countertops in the kitchen have been upgraded this season. If you are here for total rest and relaxation…food options begin right below. On the ground floor you will find restaurants ranging from breakfast at Seacrest Sundries or Mexican at La Cocina with many option in-between. Within walking distance, more dining options await you in Rosemary Beach and Alys Beach. The ground floor also offers an ice cream parlor, clothing, souvenir shops and bike rentals to mention a few. The hub of the Village is Peddler’s Pavilion offering live entertainment on selected evenings which you can enjoy on the ground level or from the comfort of your balcony. Remember to pack your beach towels, The Village has direct access to Sunset Beach with its sugar white sand and emerald colored water. The beach is only a short walk and for your convenience, the seasonal tram will transport you directly to and from the beach. If you want a break from the beach, please take a dip in the one of the two private pools. If you do want to venture out by car you are a short drive away from Seaside, Water Color, Pier Park (movie theatre) and Silver Sands, several springs are nearby if you enjoy kayaking . On a personal note, this unit has offered enjoyment to our family which is now in its third generation. We hope you will enjoy! * Saturday to Saturday rental Spring Break and Summer May through August. * Three (3) night minimum off season. starting May 26th, 2019 to August 2nd, 2019 (weather permitting). * Complimentary beach setup; 2 chairs/1 umbrella/ 1 table. Available Sunday-Friday, starting May 26th, 2018 to August 4th, 2018 (weather permitting). Condo was clean and spacious and well appointed in the kitchen! Location can’t be beat.....live music from your balcony, steps to everything. Tram to beach was very convenient. Awesome place and very night apartment! Will come back! Condo was great--beach access, not so much. I loved the condo--but I wish the beach access had been closer. The rule of not rolling a cart down the pedestrian walkway to the beach access seemed very odd to me. This was very inconvenient. Enough so that I would probably not choose to stay in this particular resort again. Other than that the stay was great. Wonderful family vacation. Property had everything we needed. This is my second vacation in this unit. Wow...the designer has completed their work since our last visit and it is such an inviting home away from home. Attention to detail is given keeping it safe for young children as well as sophisticated at the same time. I love my family time here on 30A and this trip was awesome. The unit was again very clean and the kitchen was well equipped with everything needed for a few meals we had in the unit. The best part is that just below the unit starts a selection of restaurants, sweet treats and anything you may need for the beach. A short walk away is Rosemary Beach with additional eateries and yes...more shopping. My family plans to return to the Charlotte again when we have a chance to visit our happy place along Hwy. 30A.